I had to abandon my blog for a few weeks as I was studying for the final exam at my university. Still, I was cooking and I managed to take a few pictures, so I have some catch up blogging to do. First, I want to tell you about the Maple Butter Cookies I made almost 3 weeks ago. I’m not really a cookie person, but I really wanted to try the maple leaf cutter which I had brought from Canada last summer. Besides, baking cookies is sooo much fun - it always makes me feel like a little kid again!!! 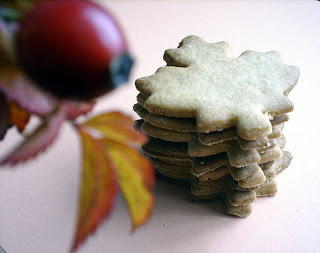 For the maple shaped cookies, I wanted to use a recipe with maple syrup. I searched the Internet for recipes of that sort and found one on Epicurious site. I’ve made a few changes to the recipe - I used brown sugar instead of the regular one, I added some baking powder, reduced the amount of salt and used two, instead of one egg yolk. I also rolled the dough thinner than the recipe says. Despite that the cookies didn’t taste maple much (the maple flavor was very subtle), they were really tasty – buttery, amazingly crispy and perfect with a cup of tea. My family loved them so much that all the cookies disappeared within two days. Cream together butter and sugar with an electric mixer until light and fluffy and beat in maple syrup and egg yolks until combined well. Sift together flour, baking powder, and salt over mixture and fold in thoroughly. Chill dough, wrapped in plastic wrap for 2 hours. Roll out the dough, then cut out cookies with maple-leaf cookie cutter. Arrange cookies on buttered baking sheets. Bake for about 12 minutes, then transfer to racks to cool. That's a great idea! 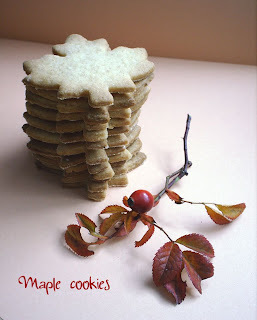 And maple syrup -flavoured cookies wouldn't just be the same without this maple-leaf shape:) Great idea! !